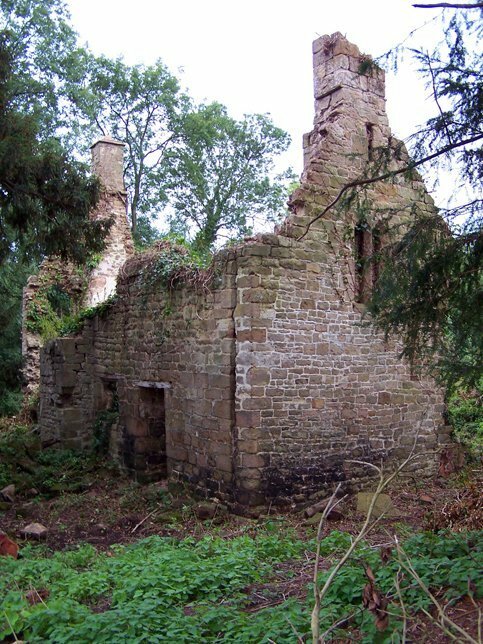 Penyard Castle lies near the top of Penyard Hill in a 75 acre clearing in the woods. 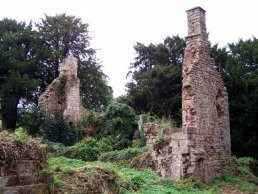 The Castle was possibly built as a hunting lodge by Aylmer de Valence, who died in 1324 and who was also responsible for building Goodrich Castle, and it may previously have been a hermitage used by the monks from Grace Dieu, Gwent. The remains of a block of buildings stretching north to south can be seen and the remains of an undercroft date from around the later half of the 14th century. It was ruined in the late 17th century when the current house was built in around 1800 which incorporated part of the earlier buildings. The remains of the house stand on a natural terrace with a scarped enclosure on the south and east sides. 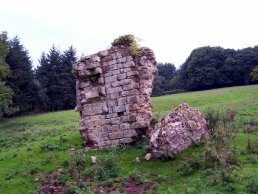 These consist of the foundations of a thick wall and various other fragments of walling, including the remains of a small flight of stairs and a doorway with a chamfered jamb and two centred head. Part of a ditch is also still visible to the southwest although there are very few signs of the castle or it's earthworks. It is rumoured that the stone from the castle may have been used to build parts of Bollitree Castle. These are various shots of the ruins of the house that stands on the site of Penyard Castle. In the 1950's this house still had a roof and was in a considerably better condition. The house is of quite an interesting construction. In the picture on the right, it can be seen that the two walls in the middle of the shot,are butted up against each other rather than being tied together. This maybe because it was one of the the walls of the previous building which was incorporated straight into the new building. Some other parts of the remaining structure also show signs of reused walls with several blocked up doorways and other walls butted straight together without being tied together. Under the north west corner of the building (where the dip in the ground is in the centre of the top most picture of the site) there used to be a tunnel from the field side down under the house possibly into the cellars. This was present in the 1950's but has since been filled in or collapsed. Down the hill, below the house is a big square, stone lined shaft into the ground. The use is unclear but it may well have been a well or something similar. A cave hidden under the castle contains a vast horde of gold and gems. The wealth is protected by a large bird which never sleeps, and attacks any who come too close to discovering the cave. According to legend, a local farmer discovered two iron doors beneath the ruins of Penyard Castle and collected a team of 20 oxen to tear them open. As a precaution against evil he made a whip of Rowan which he knew would protect him and a splinter from a Yew Tree in his pocket as an additional safeguard. Eventually the doors opened and there stood two great caskets of treasure and a jackdaw perched above them. As he was about to enter the doors slammed shut and a voice rang-out “Had it not been for your quicken-tree goad and your yew tree pin, you and your cattle had all been drawn in.” Terrified the farmer fled. Looking at this tale it seems that it is a warning against using the old religion and allowing the tree spirits to protect you. To the west of the site of the castle, is a small field which used to contain a small shed in it's north western corner. This was moved during the late 1950's or early 1960's to Aston Ingham to be used as the Scout hut.